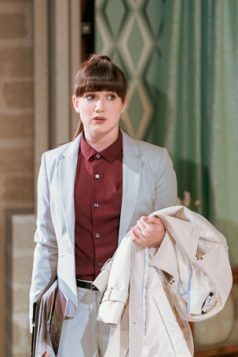 Laura Wade’s most famous play to date is Posh. In it she peeled back layers of inherited wealth and privilege to reveal the ugliness of entitlement. 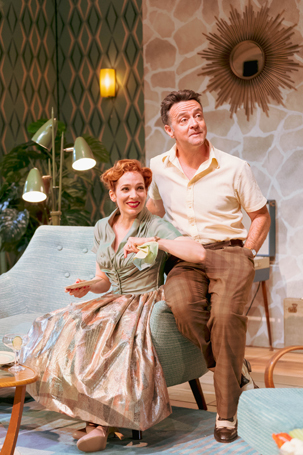 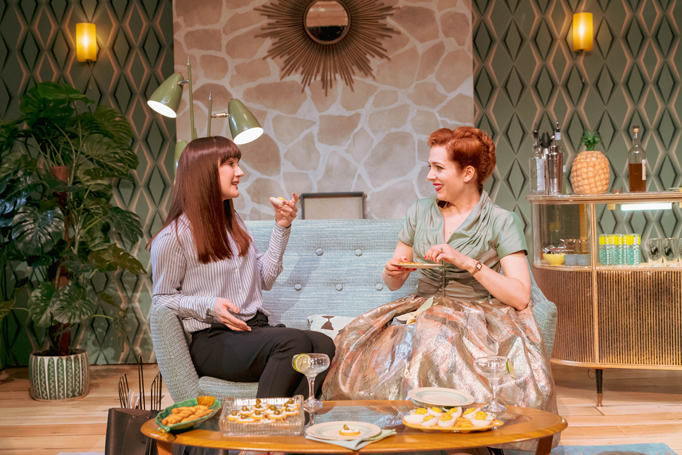 Her new play, Home, I’m Darling, is similarly perceptive in digging its nails into a shiny veneer – this time, the craze for 1950s vintage – but what lurks below here is a mixture of blinkered nostalgia and heart-breaking female desperation. 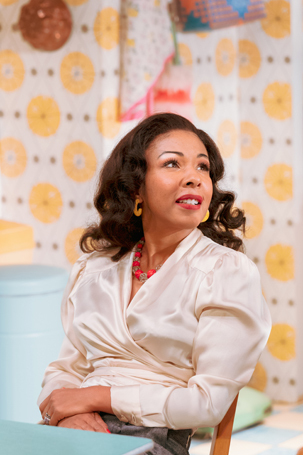 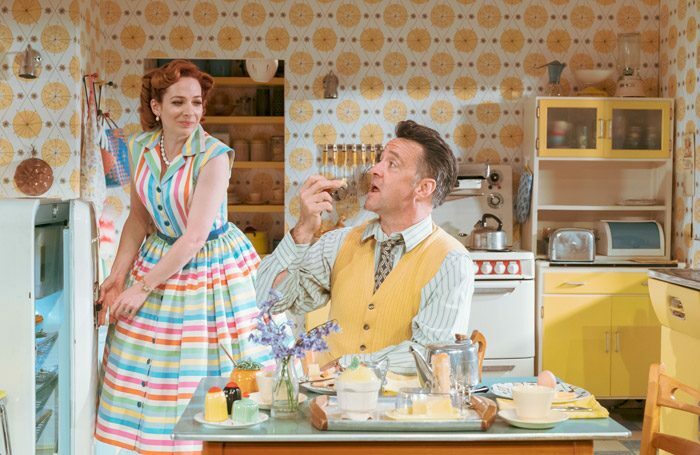 Judy (Katherine Parkinson) has the ideal 1950s home – a “gingham paradise” as her mother, Sylvia (Sian Thomas) christens it – yet the world outside those geometrically-patterned walls has moved on to iPhones and #MeToo feminism. 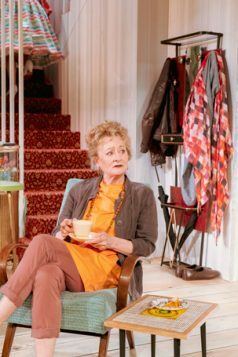 Parkinson’s performance is as immaculately precise as her character’s outfits. 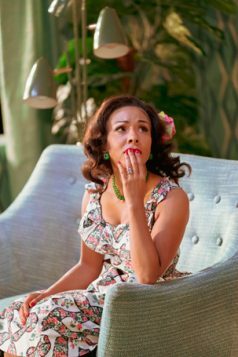 A former finance worker, the cracks in her lipsticked persona show almost immediately. 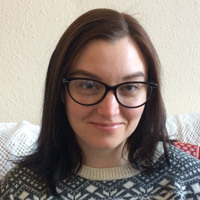 Little waves of anguish ripple through her declarations of love for husband Johnny (Richard Harrington) who, in turn, acts as a man visibly surprised to find himself drowning, when he doesn’t quite remember jumping into the river in the first place. 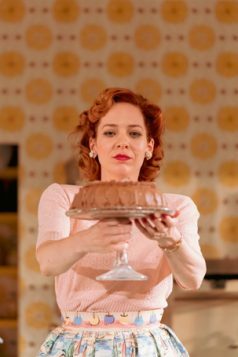 Kathryn Drysdale is also great as Fran, a woman who adopts the pencil skirt and heels look, but can’t be arsed to cook. 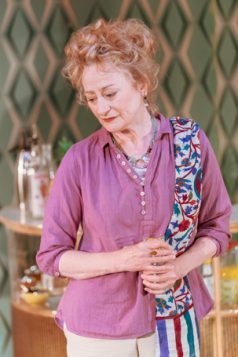 The counterweight to all this vintage fanaticism is Thomas’ Sylvia, who absolutely embodies the Thatcher-hating, CND-supporting generation before Judy without every becoming a cliché of hippy activism. 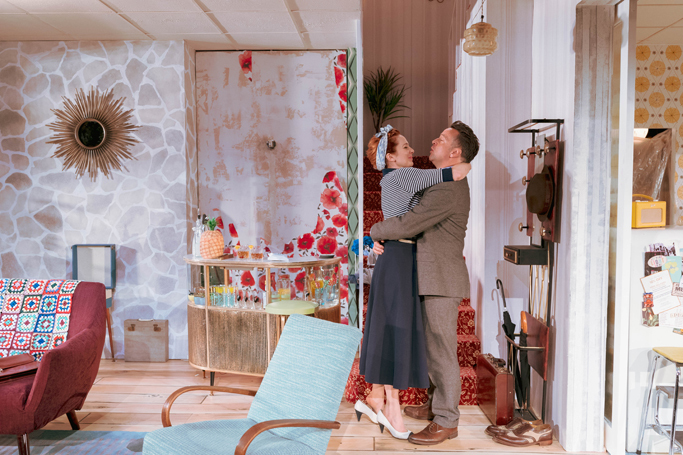 A play about visual aesthetics demands impeccable design, and Tamara Harvey’s production has this down in the form of Anna Fleischle’s colour-coordinated two storey house. 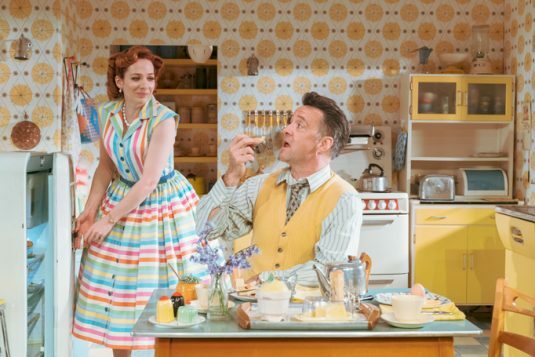 From the sunshine yellow kitchen to the pastel pink bathroom (with matching ceramic suite, naturally), this really could be the home of an eBay-trawling obsessive. 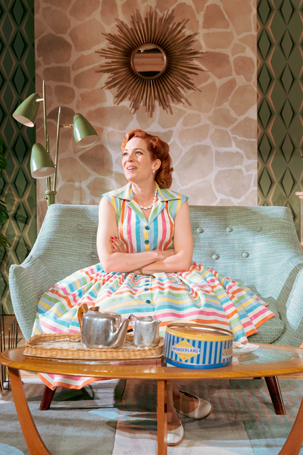 The infectiously catchy soundtrack of era-appropriate hits replicate Judy’s keeping-up-appearances lifestyle. Because without the toe-tapping tunes, much of what remains is really very sad. 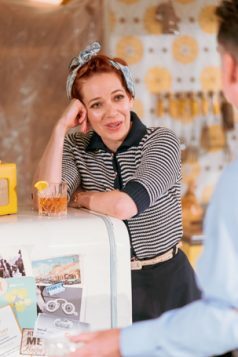 As cocktail hour keeps creeping forward, and the preference for having nothing “bad” said in the house sounds increasingly pathological, it becomes clear that all of this dressing up is about needing a template of how to be a woman. 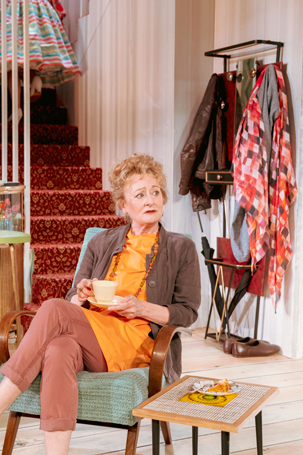 The beauty of Wade’s play is that it questions Judy’s individualistic version of ‘feminism’ without judging it. 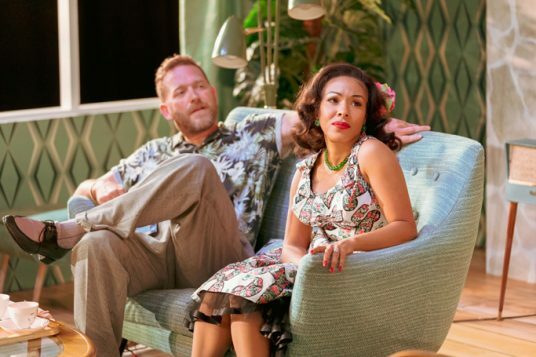 The real reason the curtains need to match the napkins connects to a deep rooted fear in change, the wobbly moments everyone – whatever their gender – gets when confronted with the exposing, confusing, modern workplace or (as Freud would agree) the unfathomable moments of childhood witnessing adults do things you can’t control. 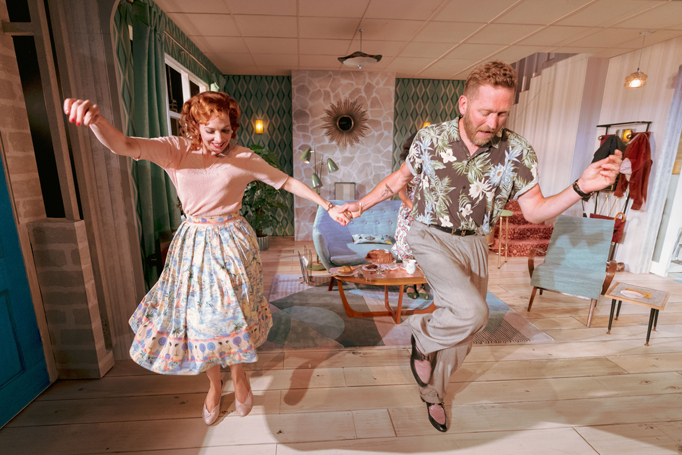 More than that, this is really a play about marriage and relationships. 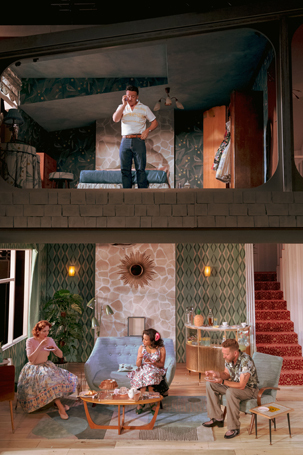 Specifically, how we so frequently try to perform roles we feel we should that, even if not as obvious and extreme as replicating 50s housewifery, unnecessarily create guilt and, in the end, drag us further apart not closer together.